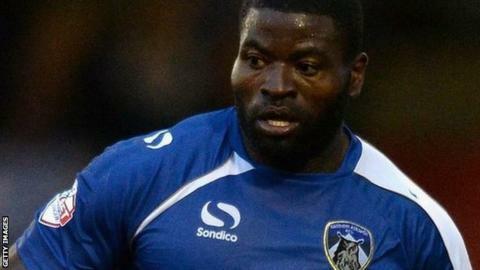 Two first-half goals in three minutes saw Oldham boost their League One play-off hopes by beating Notts County. Defender George Elokobi headed a third goal in five games from a Mike Jones cross to put the Latics ahead. The lead was doubled almost instantly as Amari-Morgan Smith raced clear to finish coolly from just inside the box. Substitute Jonathan Forte's overhead kick hit the bar as Oldham dominated the second half before he headed in a game-clinching third at the far post. It could have been even worse for the out-of-form Magpies as veteran keeper Roy Carroll twice denied Dominic Poleon and also Danny Philliskirk with excellent saves. Oldham climb to 10th in League One, two points shy of the top six, while Notts County are now 13th after only one win in their last nine league matches. "I think the boys worked their socks off didn't they? "I was disappointed last week to come away not winning that game when we did well enough to win it - today we've created five or six very similar chances, this time we put them away. "I was really pleased because it's really important for us to get a win today - for us, and everybody, six points out of nine is not a bad return." Match ends, Oldham Athletic 3, Notts County 0. Second Half ends, Oldham Athletic 3, Notts County 0. Attempt missed. Curtis Thompson (Notts County) right footed shot from outside the box misses to the left. Delay in match William Hayhurst (Notts County) because of an injury. Foul by Kaiyne Woolery (Notts County). William Hayhurst (Notts County) wins a free kick in the attacking half. Corner, Notts County. Conceded by Liam Kelly. Goal! Oldham Athletic 3, Notts County 0. Jonathan Forte (Oldham Athletic) header from the centre of the box to the bottom right corner. Assisted by Connor Brown. Attempt missed. Jonathan Forte (Oldham Athletic) left footed shot from the left side of the box is close, but misses to the right. Attempt missed. Kaiyne Woolery (Notts County) right footed shot from the right side of the box misses to the left. Attempt blocked. Michael Jones (Oldham Athletic) right footed shot from outside the box is blocked. Attempt saved. Danny Philliskirk (Oldham Athletic) right footed shot from the right side of the box is saved in the bottom left corner. Substitution, Notts County. Billy Daniels replaces Balint Bajner. Corner, Notts County. Conceded by James Wilson. Kwame Thomas (Notts County) wins a free kick in the defensive half. Substitution, Oldham Athletic. Jacob Mellis replaces Dominic Poleon. Attempt missed. Liam Kelly (Oldham Athletic) right footed shot from outside the box is too high. Jonathan Forte (Oldham Athletic) hits the bar with a left footed shot from the centre of the box. Corner, Oldham Athletic. Conceded by Roy Carroll. Attempt saved. Carl Winchester (Oldham Athletic) right footed shot from the centre of the box is saved in the bottom left corner. Attempt saved. Dominic Poleon (Oldham Athletic) right footed shot from the centre of the box is saved in the centre of the goal. Corner, Notts County. Conceded by George Elokobi. Corner, Notts County. Conceded by Michael Jones. Attempt saved. William Hayhurst (Notts County) right footed shot from outside the box is saved in the centre of the goal. Attempt blocked. Liam Noble (Notts County) right footed shot from outside the box is blocked. Attempt missed. Haydn Hollis (Notts County) header from the right side of the six yard box is just a bit too high. Attempt missed. Kwame Thomas (Notts County) right footed shot from the centre of the box is close, but misses to the right. Second Half begins Oldham Athletic 2, Notts County 0.